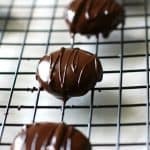 Home » Desserts » Homemade Peppermint Patties (Vegan, Allergy Friendly). Homemade Peppermint Patties (Vegan, Allergy Friendly). 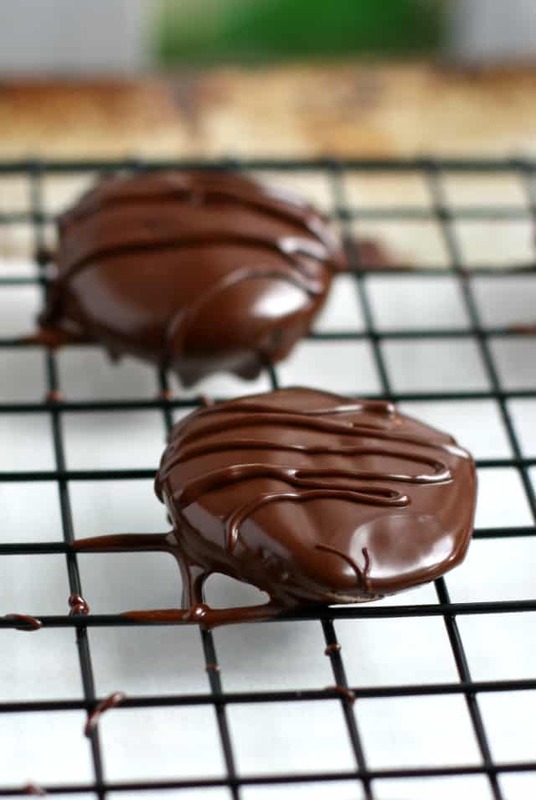 Homemade peppermint patties are surprisingly easy to make! 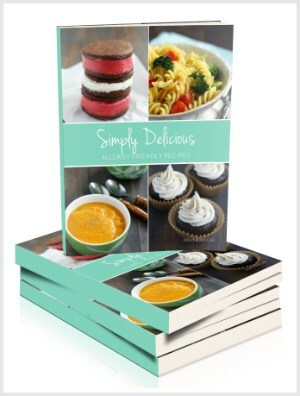 Enjoy these sweet treats this season – this version is vegan, gluten free, and allergy friendly! Halloween…it’s almost here. It can be so tricky to make sure everyone feels included on this candy centered holiday. It’s not fun to have to say “no” to your children when they come home from trick or treating with a bucket full of unsafe treats. Of course, there are a few things that you can do to help your children with food allergies feel good about Halloween. You can have safe treats or toys ready to make an exchange with your children for their unsafe candy, you can buy safe candy, and you can also make safe versions of popular candy at home. 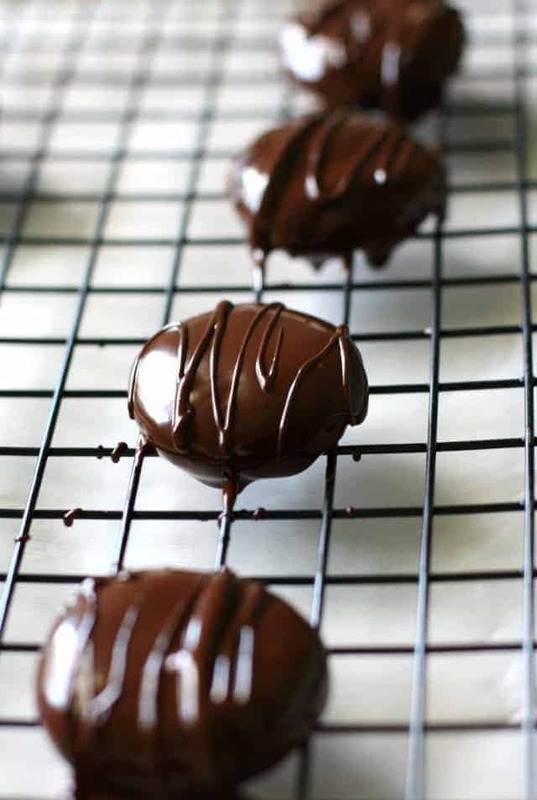 Which brings us to these homemade peppermint patties. 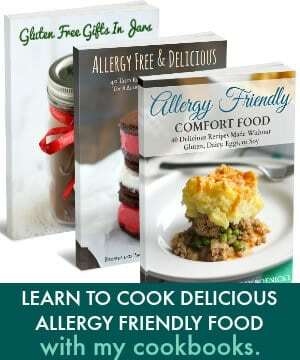 They’re allergy friendly, vegan, and SO delicious. Much tastier than the store bought version. During the October, you’re probably busy. There are costumes to buy, and treats to make, and parties and events to attend. You probably don’t have time for a really complicated recipe. These homemade peppermint patties couldn’t be easier. And truthfully, they couldn’t be more delicious. Cool and creamy peppermint filling is coated in delicious dark chocolate. Just a few ingredients make these allergy friendly peppermint patties extra special. You can even get foil candy wrappers at Michael’s or Jo Ann’s to make these candies even more fun. And spoiler alert: you’ll probably find yourself sneaking one or two or three of these out of the Halloween stash. They’re so good. Mix the powdered sugar, vegan buttery spread, non-dairy milk and extracts to make the filling. Roll the filling into balls and flatten. Refrigerate. Melt the chocolate and stir in the oil. Dip the chilled patties into the melted chocolate. Wrap in foil candy wrappers if desired. Are peppermint patties corn free? If you use powdered sugar that contains tapioca starch rather than corn starch, then this recipe will be corn free. You don’t need corn syrup to make the filling. Where can you buy nut free and dairy free chocolate chips? Both Enjoy Life and PASCHA Chocolate make several varieties of allergy friendly chocolate chips. Take a look at their sites and see if something will work for you! Rich and delicious homemade peppermint patties are the perfect holiday treat! Put the sifted powdered sugar, vegan buttery spread, extracts, and non dairy milk in a mixing bowl. Mix on medium speed until the dough comes together into a big ball. It will be sticky and somewhat firm. Put the 1/4 cup of powdered sugar into a small bowl. Line a cookie sheet with parchment paper. Take tablespoonfuls of dough and dip into the sugar and roll into balls. Place on the cookie sheet and flatten with your hand. 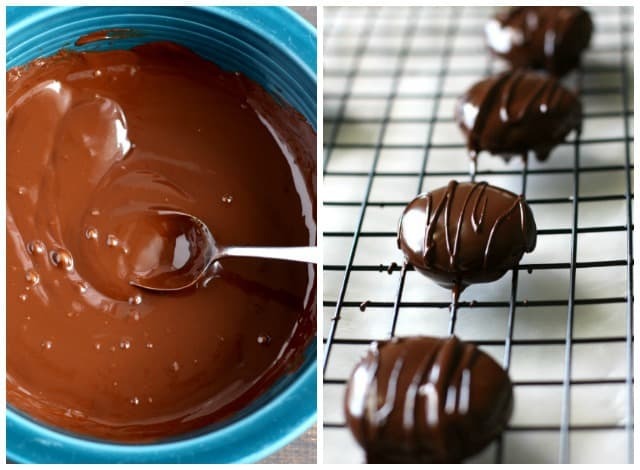 Melt the chocolate in the microwave or in a double boiler. Stir in the oil. Let the chocolate cool to room temperature. (If it's too hot, it may melt the filling). Using a fork, dip the patties into the chocolate, and let the excess drip off. Place onto the parchment lined cookie sheet again. Refrigerate coated patties until firm. 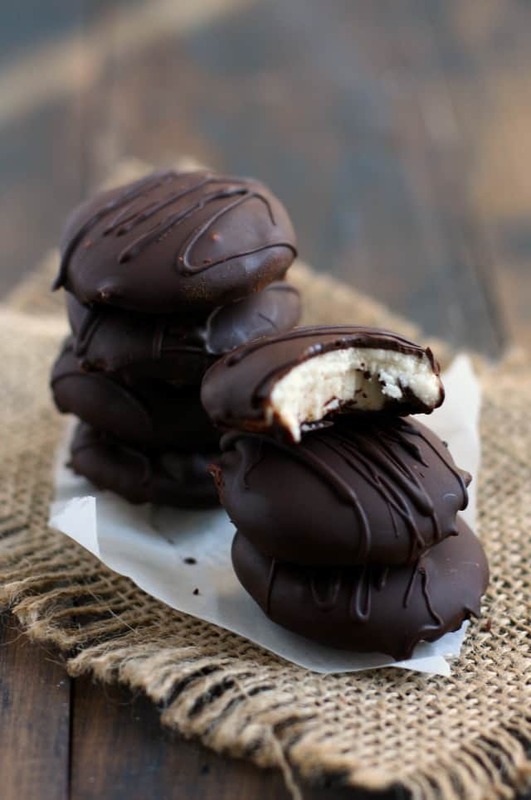 Store peppermint patties in the refrigerator or freezer. You can wrap each peppermint patty in foil candy wrappers if you wish. These candies will keep in an airtight container for one week. If you are not dairy free, feel free to use your regular chocolate chips and milk. You can make more varieties of chocolate treats at home – read my guide on how to make allergy friendly candy. 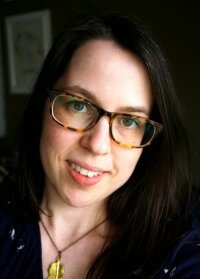 This post was originally published in October 2016. It has been updated with more tips. « Easy Vegan Cheese Ball (Nut Free). 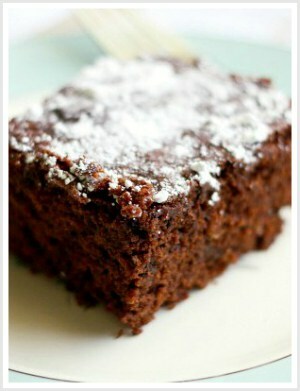 Is it possible to make this with cocoa powder instead, as I have a problem with high fat chocolate. Can’t wait to try these! Whenever I have to dip candies in chocolate, it always looks clunky. Still tastes good(! ), but I’m sure there has to be a better way than what I’m doing. Any tips? I made bounty bars at Easter and this looks like the perfect next sweet treat to make!